Founded in January 2015, TAG is an industry-led 501(c)(6) not-for-profit organization. It is the leading member-based global certification program fighting criminal activity and increasing trust in the digital advertising industry. 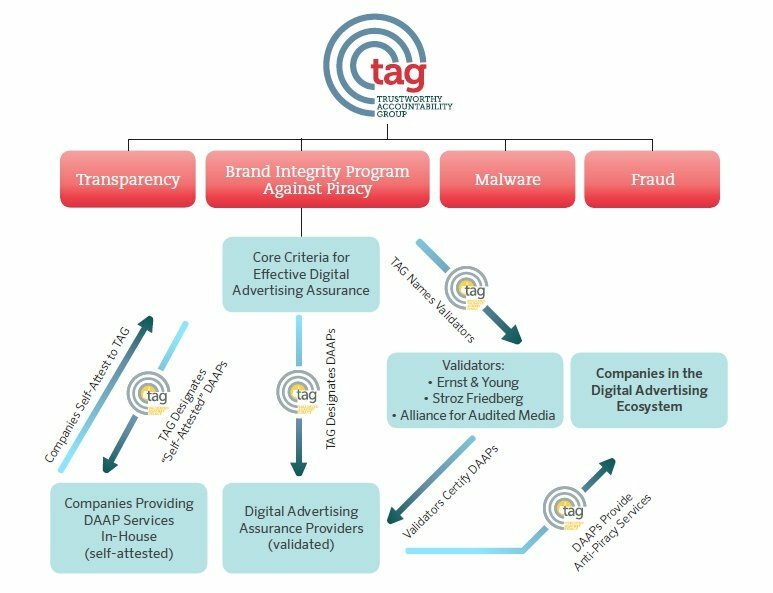 TAG’s mission is to eliminate fraudulent traffic, combat malware, prevent internet piracy, and promote greater transparency in the digital advertising supply chain. TAG advances those initiatives by bringing member companies from across the digital advertising supply chain together in a variety of working groups to set the highest standards for its certification programs in these four areas of our mission. Industry self-regulation is an effective means of addressing the challenges facing the digital advertising ecosystem. During the past year, independent research has measured the effectiveness of TAG’s anti-fraud and anti-piracy efforts and found them to be highly successful at combatting criminal activity in the digital advertising supply chain. This research proves that when the industry works together, it is possible to solve even the most nefarious threats in the digital marketplace. A full video of the hearing can be found here. As background, I've been deeply involved in collective efforts to stop ad-supported revenue from enriching criminals who profit from the theft of intellectual property over the last several years. Among those efforts, GroupM teamed up with companies from every part of the advertising industry to form the Trustworthy Accountability Group (TAG), an organization created to fight criminals, protect brands and shore up the integrity of the digital ad supply chain. By raising the bar for ourselves and our partners, we can cut off the remaining flow of money to the criminals who steal our intellectual property and take a vital step in protecting our brands. Now that we have these criminals on the ropes, let's knock them out for good. The full op-ed can be found at Media Village. Earlier this week, TAG signed a new European Commission’s Memorandum of Understanding (MoU) on Online Advertising and Intellectual Property Rights (IPR), the culmination of many years work and discussion between the European Commission, the digital advertising sector and the creative content community. TAG encourages its members to add their signatures to the MoU to show their support. Companies can demonstrate their compliance with the MoU through TAG’s Certified Against Piracy program, a strong validation of the TAG program’s effectiveness. The MoU commits brand advertisers and companies engaged in digital advertising to minimize the placement of advertisements on digital properties and thus reduce the revenues that such properties gain from digital advertising revenue. But are poor data collection habits enough to make viewers turn away from a site? Panelist Rachel Nyswander Thomas of the Trustworthy Accountability Group thinks viewers send a different message when they avoid ads. Ronald Reagan once famously declared that America’s nuclear policy toward Russia was to “trust but verify” that the world power was acting transparently and following through on their commitments. The same is true for advertising today where far too many actors talk the talk on quality but fail to make even the most basic investment. Verification procedures, like certification through the Trustworthy Accountability Group (TAG), were created to fight fraud and other criminal activity in the space. Certified companies, particularly those who take the extra step of independent certification, have made longstanding commitments to quality in the industry and bear a mark of trust among publishers and advertisers. Advertisers looking to cut ad fraud by more than 80 percent can make one simple change: require that their advertising dollars only flow through TAG-certified partners. Brand safety still continues to be a concern for advertisers, but the market has come a long way – initiatives such as the Trustworthy Accountability Group’s (TAG) Anti-Fraud Registry, the Media Rating Council’s (MRC) Viewability Guidelines, plus the Good Practice Principles set out by JICWEBS and the DTSG have helped ensure quality, transparency, and accountability. Now we have greater awareness and understanding of best practice; this is becoming part of daily operations, although this progress is absolutely incumbent on everyone in the ecosystem remaining vigilant and continuing to invest. One of the historical challenges was that tools were not necessarily in place to make the discovery of bad actors/vendors a more readily accessible process. These initiatives bring light to the industry and make it increasingly easy to flag and avoid bad actors and their enablers.